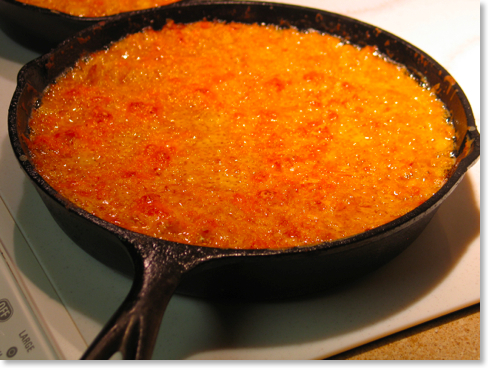 Every now and then, someone asks me--“So what’s the big deal about cast iron?” There are plenty of other pans around. Plenty of other ways to cook. 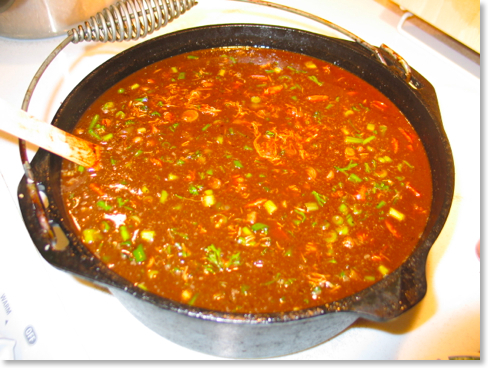 Why should someone entertain the use of cast iron cookware to begin with? Here are a few reasons to use cast iron. Maybe you’ve been toying with the idea of cooking in cast iron for a while, and this will help to push you over. (1) Cooking in Cast Iron Makes Food Tastes Great. It’s easy to talk about food that tastes good, but I only hear about cookware that makes food taste better from folks who have switched to cast iron. Cast iron distributes heat evenly over the cooking surface, second only to copper pans. But cast iron has an advantage because its unique properties affects the texture of food cooked in it. Anyone who’s ever eaten a properly cooked piece of cornbread from a cast iron skillet can testify to this. Maybe it’s true that copper conducts heat better, but I never hear anyone bragging about cornbread made in a copper pan! I’ve begun cooking casseroles in cast iron for this very reason, but even sauteed vegetables and meats cooked with a light amount of olive oil produce results that pans of other materials simply cannot match. (2) Cooking in Cast Iron Is Healthy. This is true for a number of reasons. First, cast iron pans are a great way to get trace amounts of iron into your diet (see the first question and answer here). Many have pointed to the rise of other materials for cookware (aluminum, chemically treated non-stick pans, etc.) in the mid-twentieth century as a direct correlation to the rise in people being diagnosed with iron deficiencies today. There are also serious questions raised about the danger of cooking surfaces such as teflon when used at high temperatures (see MSNBC: “Teflon Chemical Cancer Risks Downplayed”). It is well known that fumes from teflon pans (and possibly other chemically treated non-stick surfaces) can cause the death of birds kept as family pets (see “The Silent Killer” by Joanie Doss). Aluminum pans aren’t necessarily safe either. Though a definite causal relationship has not yet been established, a common factor seen in Alzheimer’s patients are aluminum strands found in the brain (see Alzheimer’s Society: “Aluminum and Alzheimer’s Disease”). Whether aluminum cookware is one of the factors in this is yet unknown, but some believe that heating foods at high heat in aluminum pans causes the metal to leech into foods. Note also that aluminum pans are almost universally used in restaurants where food is usually cooked quickly at very high temperatures. On the other hand, cooking in cast iron negatively affects only an extremely small portion of the population--those who suffer from too much iron in the blood. This condition is referred to as hemochromatosis. This is not an issue for the average person, and for those who suffer from too much iron in the blood, I’d still recommend enameled cast iron for all the other reasons mentioned here. Another healthy aspect of cooking in cast iron is that it is so enjoyable, you will be encouraged to cook at home more often, which is always healthier than eating out or warming up pre-packed foods in the oven. (3) Cooking in Cast Iron is Versatile. Not only that, it’s durable as well. What other kind of cookware can move so effortlessly between the stove top and the campfire? Today, cast iron can be found in use from all sorts of people--from the gourmet chef to the campfire cook. Although cast iron is making a strong return to America’s kitchens, it never left the campsite. It was cast iron that sustained America from the earliest pilgrims to the pioneers who traveled west. Cast iron is hardy and very difficult to permanently damage unless it’s downright abused. I’ve easily used some of the same pans in my kitchen when we’ve gone camping as well. 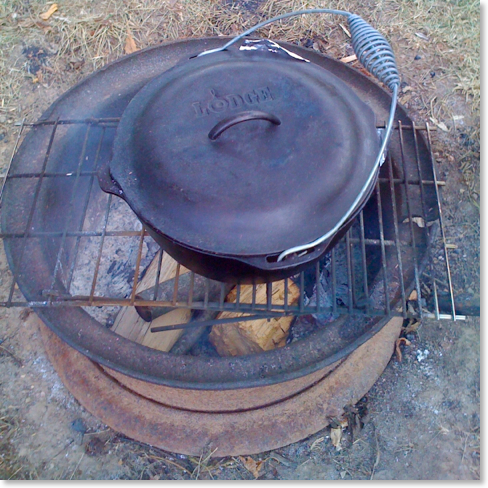 Although most campers will want to obtain dutch ovens specific to the campfire, a lot of us can confess to throwing regular dutch ovens in the fire, too, with no harm coming to them because of it. (4) Cooking in Cast Iron Is Responsible. You’ll want to see my post “Green Iron: The Environmental Benefits of Cooking in Cast Iron,” but needless to say, cast iron is perhaps the most environmentally friendly kind of cookware available. When treated well (and often even when not!) cast iron can last for generations. I regularly use my grandmother’s skillets (one of which is pictured to the right) which are at least 70 years old, but that’s nothing. There are cast iron pans from the 19th century still in regular use today! Older pots than that are around, too, and if most of them weren’t in museums, they would still cook just fine. (5) Cooking in Cast Iron Creates a Legacy. In his book Dutch Ovens Chronicled, John Ragsdale points out that Mary Washington (the mother of George Washington) included her cast iron collection in her will (see p. 28). I’ve already mentioned that I regularly use two of my grandmother’s skillets and still assume I will be doing so when they are well over a century old. We also have a couple of cast iron chicken fryers left to us from Kathy’s grandmother that I’m in the process of restoring. 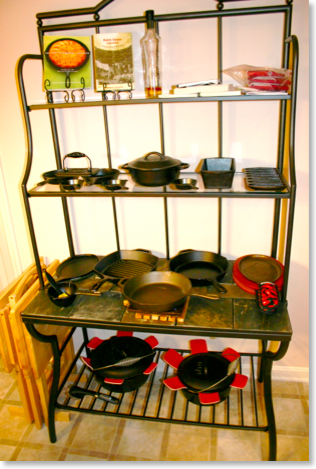 According to Kathy’s mother, her father used to often clean these pans by throwing them into a fire in the back yard! Now think about it for a second. Do you really think that your aluminum pans, your chemically-treated non-stick pans, or your electric skillet will be in use too many years from now? Is there any chance you'd be able to will them to your family members? Would you even want to? With cast iron, it's a different story. When done with thought and care, the preparation and eating of meals together can be very intimate and memorable occasions. In today’s busy society, too often people don’t take the time to make a meal from scratch and sit around the table together. 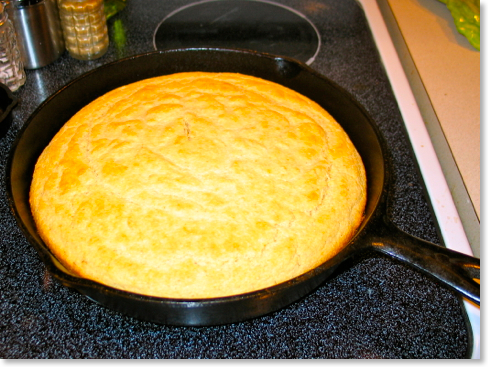 When I make my grandmother’s cornbread (see recipe here) in her skillet, I think of all the times I sat at her table eating her wonderful foods. That skillet is forever tied to her memory. I can’t use it without thinking of her. If I had to only keep one item in my cast iron collection, I would choose that one. One day I will pass on my cast iron to others. I hope that when they use them, they will think of me and the good times we had sitting around the dinner table. Perhaps you have a cast iron pan or pot from a family member who has now passed on. Take that pan down, relive some memories and create some new ones.